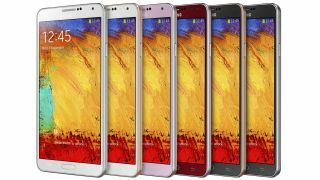 If the giant Samsung Galaxy Note 3 doesn't stand out enough in its native shades for some flashy smartphone fans, those phablet fanciers can now pick it up in new red and gold hues. The Korean mobile giant has now unleashed the new colours in the UK after announcing their impending arrival just before Christmas. The rose gold white (pretentious much?) and merlot red (now that's more like it) handsets can be snapped up from Carphone Warehouse. However, there's no sign of the rose gold black (what?) version also announced in December, but the smart money is on that showing up relatively quickly hereafter. The Galaxy Note 3, announced at IFA 2013 last autumn is the largest and highest spec device in the successful big-screened range yet. Alongside its 5.7-inch, 1080p display, there's also a nifty 2.3GHz quad-core Snapdragon 800 processor and a 13-megapixel camera. In our TechRadar review, we praised the device for it's speedy performance, solid battery life and excellent full HD display. Points were knocked-off off for it's tacky faux-leather rear casing, hefty price point and the tricky grip.